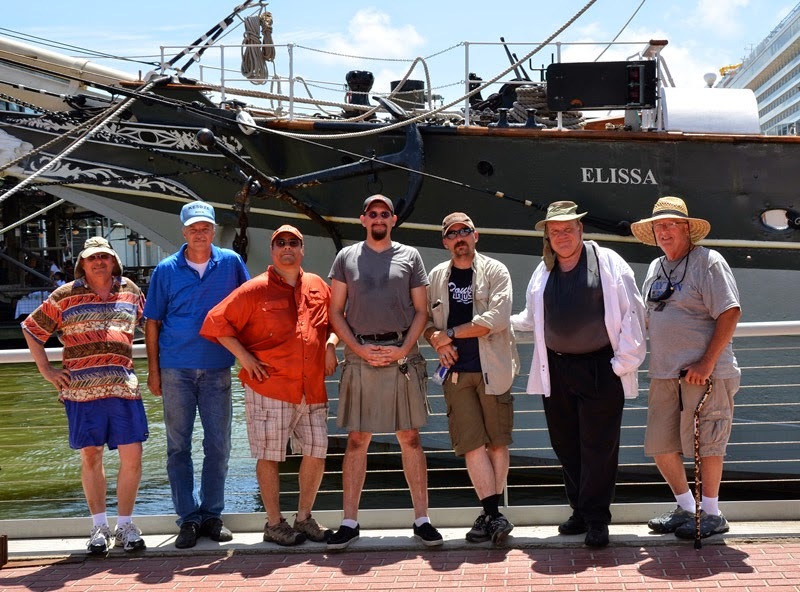 This year was our third year for activating the 1877 Tall Ship Elissa for Museum Ships Weekend. Each year has been different than the year before. But, some things do remain constant. We literally have to build the stations each morning and take them down each afternoon. On the Saturday evening of MSW, the Elissa holds her largest fundraiser of the year. We have to be out of the area by 5:00 pm. Our activations are always a group effort. We are not a club, just a bunch of amateur radio operators who get together to do an event, once a year.. We exchange emails on who is bringing what and then deal with the gremlins as they show up. I don't know that I would have it any other way! Our first year we operated on a concrete wharf right next to the Elissa. 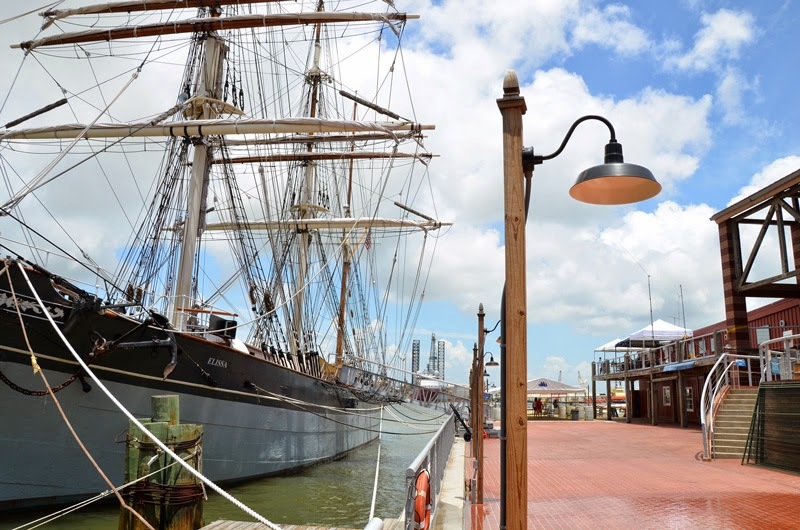 Her normal berth was being renovated due to damage caused by Hurricane Ike. In fact we barely made the time frames to activate the Elissa that year. She went into dry dock two weeks later for hull repairs so she could regain her seaworthy certification. The hull damage was courtesy of Hurricane Ike too. That year we had one hf station and a 2 meter station for a ships two meter net. Our second year we operated from a deck overlooking the Elissa in her normal berth. We had two hf stations that year with a 2 meter/satellite station. We added more operators. Saturday the conditions were horrible. Sunday morning had us holding down canopies, in the middle of a thunderstorm, as they tried to go airborne. Once the weather passed, we set up and had a whale of a day. This year, we had three hf stations and a six meter station. Saturday was real good. Propagation was steady. Rick, KE5BZE and his son Richard, KF5FIB worked a strong pile up on 20 meters all day long! We had 3 six meter contacts as well. 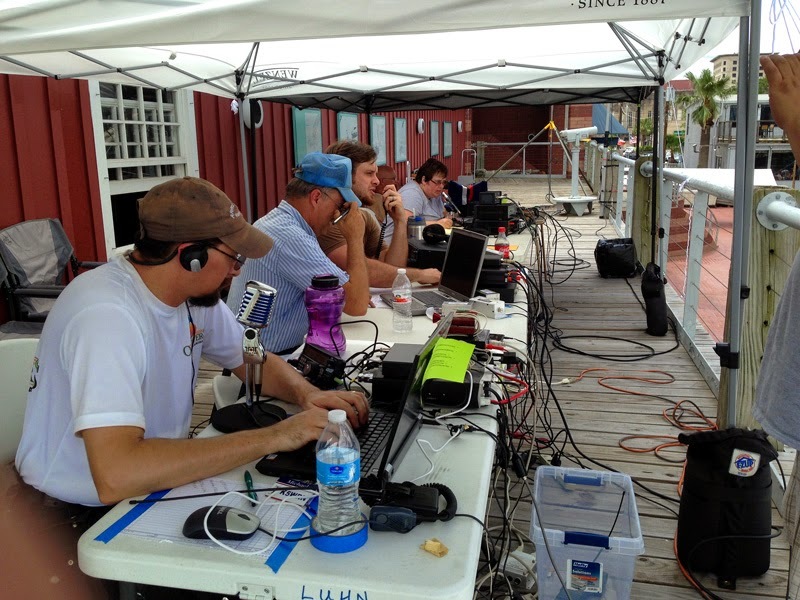 We even manged to work a little dx on 17 meters. We lost two operators this year and added three new ones. Sunday started good on 20 meters but a strong geomagnetic storm wiped out the bands for us. Finally at 2:00 pm we made the decision to pull the plug. We had made 1 contact in 1 hour and 20 minutes of calling on multiple bands. The pictures and videos below are from the weekend. I hope you enjoy. This shot shows the operating positions on the deck overlooking the Elissa. from Nearest to further-est: Michael, K5WRN; Rick,KE5BZE; Richard, KF5FIB ; Stephanie,K5SFV; and James, W5AOO. This photo was taken Sunday afternoon after we had everything down and loaded for the trip home. Left to Right: Leslie, AD5WB; Rick, KE5BZE; Nathan, N5NYV,; Michael, K5WRN; Jeremy, K0JCC; Dominick, N5TCB; James, W5AOO. Not shown in this picture are: Stephanie, K5SFV and Richard, KF5FIB. They did not join us Sunday. Photo courtesy of W5AOO. Photo with Elissa on the left and the wharf down the middle. You can see the canopies that we operated under on the right hand side of the picture. Photo courtesy of W5AOO. Operating outside, as we do, on a working harbor, has it's challenges. There is obviously the Texas gulf coast heat and humidity. Thankfully this year we had a good breeze almost all weekend. But since it is a working harbor in a tourist area there is all sorts of moving qrm to deal with. Here a few videos from the weekend. This video shows the operator positions and the harbor tour boat taking off. The harbor tour, after a while, started including us in their spiel. It was nice for MSW to be recognized to people who had no clue as to what we were doing. You can hear the 20 meter pile up and Richard, KF5FIB and Rick, KE5BZE work it down. We even tried a little cw action on Sunday. That is Michael, K5WRN at the key. Again since it is a working harbor it is open to all manner of boat traffic. In this video you will see one of three powerboats that decided to make high speed passes up the channel only to turn around come back by. Here are the other two powerboats and the tour boat all coming together at the same time. Complete with long horn bursts. We really were trying to hear you! HI! You can see the top of the inverted V ten meter antenna in this photo. And of course we also had airborne QRM. A real big thank you to Jamie the Director of the Texas Seaport Museum and to Mark, the bosun for their kind help and for allowing us to activate the grand ship. We quite obviously, could do not do this without you! I hope we got to work you. All logs from this year will be posted shortly on lotw and clublog. Until next time, very 73 to you and yours. Good dx and Island hunting.